Trunks: Erect, to 12 inches in diameter; bark thick, dark grayish brown; branches more or less thorny; bark smooth, purplish or orange-brown. Leaves: Alternate, simple, short-stalked, obovate to lanceolate-ovate, 2.5 to 4 inches long, 1.25 to 2 inches wide, shiny green and glabrous above, nearly glabrous or sparsely hairy on veins below; margins sharply toothed; tips tapering to points. 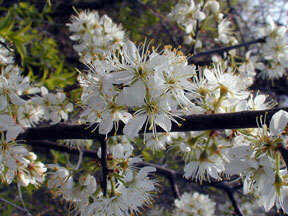 Flowers: Clusters of 2-5 flowers emerging on branches generally before leaves appear. Flowers 3/4 to 1 inch wide, short-stalked, fragrant; sepals 5, conspicuously bent backward; petals 5, to 1/2 inch long, white; stamens 20-30; many flowers not producing fruit. Fruit: Fleshy, spherical, reddish purple or yellowish with red blotches, about 1 inch in diameter, tough-skinned, 1-seeded. Habitat: Woodlands, thickets, stream banks, ravines, and roadsides. Uses: Native Americans ate the fruits fresh, cooked, or dried. Some tribes bound the twigs together and used them as brooms, and the appearance of the blossoms was sometimes used to time the planting of corn, beans, and squash. Wild plum thickets provide excellent wildlife habitat, and their root systems help prevent soil erosion. Comments: Wild plum forms dense thickets. The edible fruits appear in August or September and are sweet and juicy.